Valle Grande (San Rafael) opens hidden secrets, stunning forms of landscape, artificial lakes, rafting at its best, windsurfing, canoeing, zip line adventures, all terrain vehicles tours. 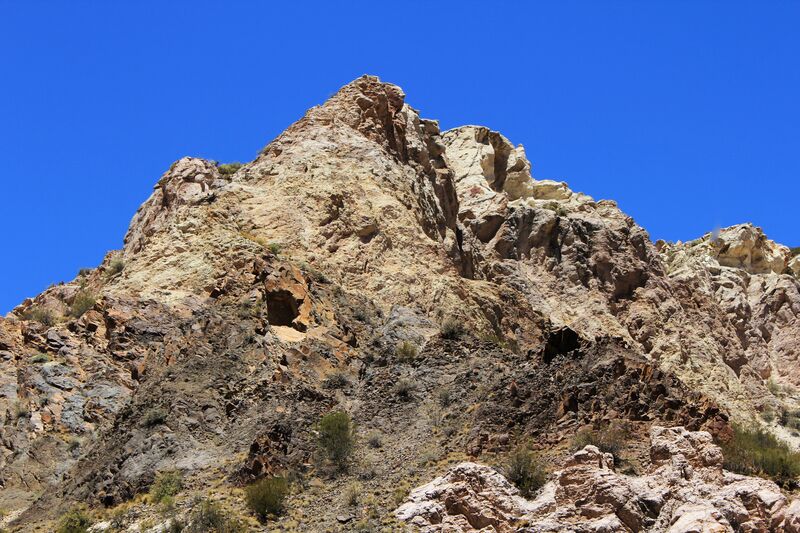 Like most canyons, the Cañón del Atuel is an “open book” of geology and history of the South-American Continent over the several hundreds millions of years of the Palaeozoic Era (from the Late Carboniferous to the Early Permian Periods). It is a witness of continent’s origins through the sequence of violent tectonic forces, volcanoes’ eruptions with rivers of lava, “slow motion movements” of continental plate exposing sea sediments and tireless erosion process by the combined forces of nature - water, wind and sun. However unlike other famous canyons, the Atuel Canyon is accessible by the dirt road meandering along the river on the bottom of the canyon. The road was built here during the construction of the Los Nihuiles and now, accessible by cars it opens a very new panoramic perspective on the canyons’ landscape – from the bottom up! The scenery changes like in an old-time kaleidoscope revealing in front of you strange geological forms shaped by endless erosion. To open your imagination I will just mention few, most often quoted natural rock formations alongside the canyon as “seen” by minds’ eyes of visitors. For example a “Rivadavia’s Chair” (Sillón de Rivadavia), Lizard (El Lagarto), Monks, Enchanted City (La Ciudad Encantada), Hanging Gardens (Los Jardines Colgantes), Beggar (El Mendigo), Train (El Tren) , Castle (El Castillo) , Ghost (El Fantasma), Cathedral (La Catedral), Slides (Los Toboganes), Elders (Los Viejos), …. But do not be discouraged by this ready to use list, there is still a lot of room for your imagination and “baptismal” extravaganza and I’m sure you will have your great ideas! The extra beauty of the area is added by the hidden secrets of the Sierra Pintada – deposits of copper, molybdenum, titanium, uranium, chalcopyrite, brannerite, pyrite, iron ore to name only few components of the Mendeleyev Table and their chemical compositions. The result is an astonishing spectacle of colors including the palette of white, green, yellow, red, brown, black ….and the list can go on and on! 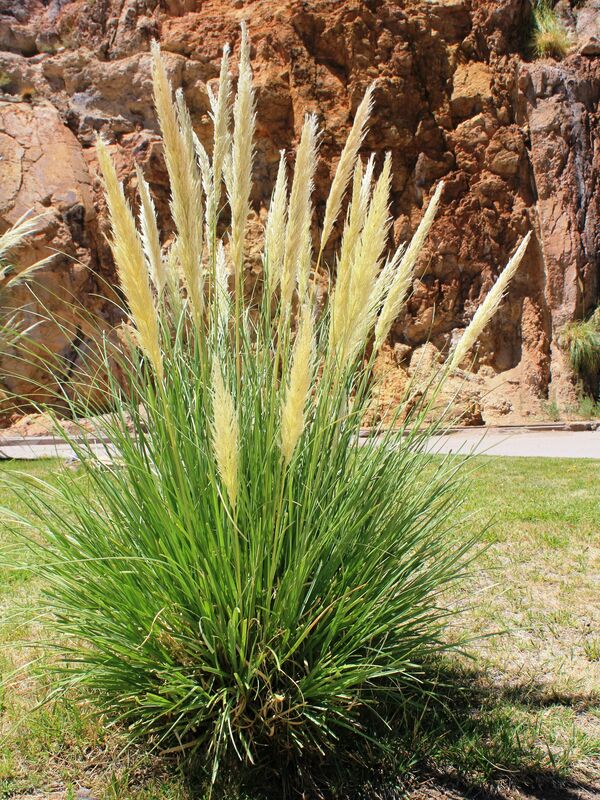 They create truly amazing effects in the areas of large reservoirs of water like the Valle Grande, enriching even more the wide spectrum of natural colors. Imagine an emerald green water mirror, blue sky and deep greenery of lush vegetation mixed with contrasting multicolor rock formations, cliffs, burned mountains…. what a spectacle! Both artificial lakes – the Nihuil (at the entry to the canyon) and the Valle Grande at its end create very popular recreational areas accompanied by tourists’ oriented infrastructure - hotels, campgrounds, weekend houses, bars, restaurants and water-sports rentals. By contrast - the Valle Grande is the place where the adrenaline is being injected to the visitors’ veins right from the start. The lake of about only 500 hectares was created by a massive 180 meters (590ft) high and 120 meters (394ft) long dam finished in 1964. For those “unsuspecting” tourists coming down the canyon the sudden opening view on the lake causes a “jaws-dropping” and breathtaking effect (both at the same time, so please be ready!). It is a stunning picture of colors and shapes of a “mountainous valley” submerged under the water. 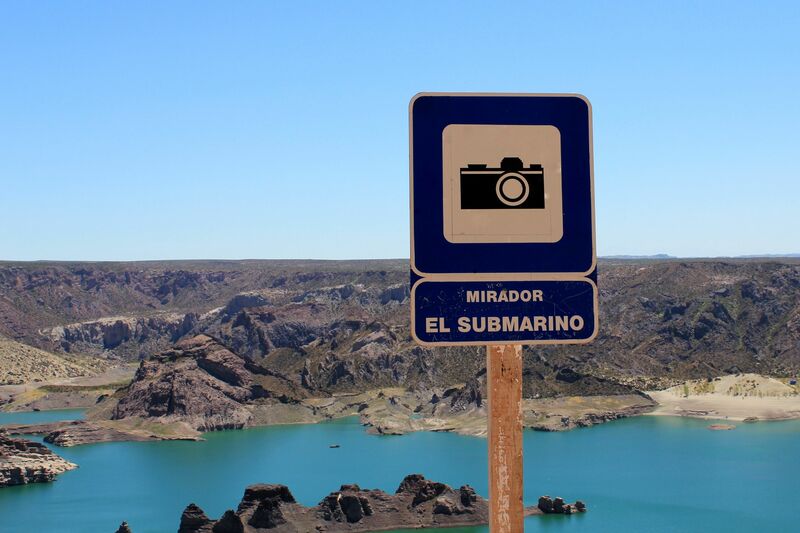 The most memorable element of this scenery is probably “El Submarino” (Submarine) – an interesting rock formation sticking out above the water in the middle of the lake. It pretends to be a mysterious vessel, may be the one having something to do with Captain Nemo (do you remember the famous Nautilus from Julius Verne’s novel)? Well, here it is! Although I cannot deny these similarities to a submarine, for me from the first moment it was rather scenery straight from the Jurassic Park showing a dinosaur taking bath in the lake….Well, that was my first impression and I stand by it being proud of having my own perceptions regardless of what “They Tell me to Think”. At the outlook point there is a panel with an inscription: El Submarino” leaving a little room for your own ideas! BTW – having your own and unbiased perceptions greatly helps in life, so please try such mental exercise when you are in the Atuel Canyon! You will find opportunities at every corner….. It may sound like a “heresy” for such unspoiled nature, but the lake is opened for recreational activities. Swimming, diving, water-motor sports (ouch!) and may be more traditional and better “coexisting” with the nature – catamaran sailing, are all available here. Atuel River back in the canyon, but only for a while. Soon after it will once again disappear in the underground tunnels. Can you recognize here some familiar shapes? So here it is - a magnificent Valle Grande with some strange rock formation in the middle of the artificial lake. The Valle Grande is also “returning” the Atuel River from the “underground world of tunnels” to where it belongs – the open nature. Surprisingly abundant and fast flowing stream of crystal clean water (after the kilometers of “nothingness” back in the canyon) creates the dream conditions for all enthusiasts of water sports. Whitewater rafting (class II and III) and canoeing at its best is offered here by many tour operators. The shortest run down the river is about 6km (3.7 miles), the longest one 16 km (10 miles). Thanks to its low level of difficulty the rafting on this section of Atuel River is accessible for families. A short note for “brave-hearted” – in the area of San Rafael there is no shortage of whitewater rafting with levels up to 6!